If you will be completing your degree requirements in Spring 2016, applications for award of the degree are being accepted through ISIS under the My Online Services menu (go to My Record > Certificate/Degree application). The application deadline is Friday, January 29th by 5:00pm. The 2016 UF Best UR Paper Contest is coming! Any UF undergraduate researcher can compete. If you want to enter, you must submit your paper to The UF Journal of Undergraduate Research, http://ufdc.ufl.edu/jur no later than February 19th and indicate that you want it to be considered for the contest. If you want to reserve the paper for a later submission to a peer reviewed journal, also indicate that you do not want it considered for publication in JUR. 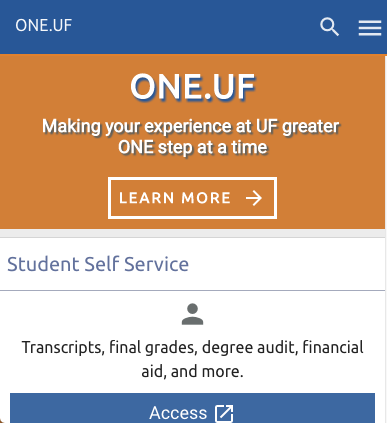 Please send an email to adonn@ufl.edu to confirm that you have submitted. Grant funded, part time position that be of interest to undergrad or graduate students with some technical ability. It involves creating a stimulation using Articulate StoryLine software for subjects to go through to see what their preferences are for online research resources. Please apply here: http://explore.jobs.ufl.edu/cw/en-us/job/495929/imls-grant-simulation-designer. Application closes Friday, January 29th. Florida Elks Youth Camp is looking for summer camp counselors. As it stands, our program offers a great opportunity for our counselors to gain experience in behavior management, planning/organization, and teamwork. Counselors work for 8 weeks (June 12 – August 6). We pay $300/week, and we provide all room and board at no cost to our staff. Our campers are 9-13 years old, and they stay with us for week-long sessions. Each counselor is paired with a second staff member and given a cabin of 7 campers. Each cabin is then grouped with 5 other cabins for activities—so there is a great mix of both small and large group organization. See flyer for additional details. My 11 year daughter has spina bifida and my wife and I are looking for one or two students that are interested in working some part-time hours this semester (mostly afternoon) to assist with picking up from school, getting her to Dr. appointments. Health care training would be helpful, but not required. Please send resume to mendywillis@ufl.edu along with the hours you are able to work. The City of Newberry Parks and Recreation department is looking for multiple interns or practicum students for the fall semester. These students would work directly with the Programs Supervisor in organizing and running the City’s Child Development Program. Please see flyer for additional details. 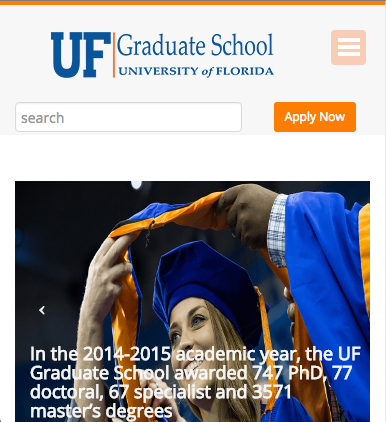 The Bob Graham Center at UF is seeking a dynamic and personable graduate student to join its team. Qualifications: Bachelor’s degree with a GPA that meets the graduate admission requirements, Must be enrolled in a Master’s/Phd Program at the University of Florida. Further details located here. I am looking for a COE student who is interested in helping tutor my 13 year old autistic son. It would require a few hours each week at our home in SW Gainesville. Primary focus is helping him with his homework. Please email jp.culverlaw@gmail.com or send a text to 352-207-5500. 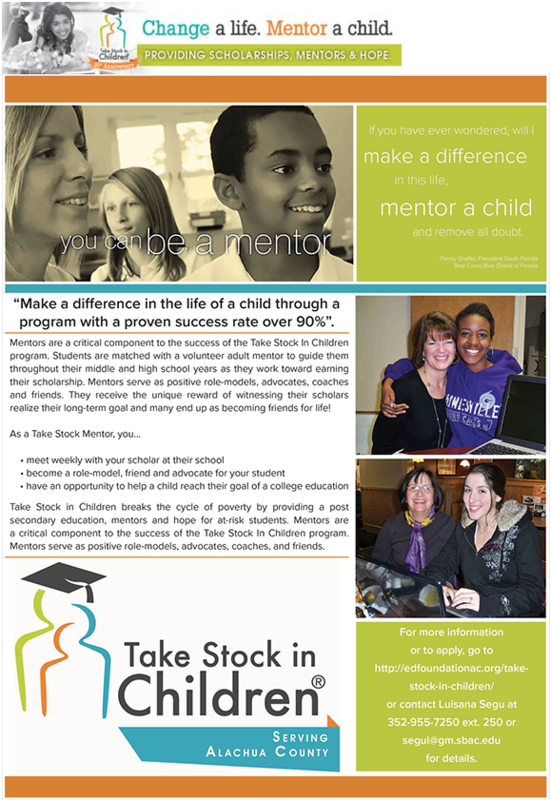 After school 2-3 days per week and help in summer. Duties include transportation from school to home or activities and homework help. Bright, cheerful, independent eleven-year-old with mild physical impairment (walks using a walker). Must have reliable transportation. Larger vehicle preferred but not required. 11th grade student needs assistance preparing for tests and ensuring assignments are complete for the following subjects: Chemistry, Honors English, History, & AP Environmental Science. If interested, please contact 352-226-9643. Milestones in the Making, Lisa Schiavoni & Associates is a family-owned & -operated private practice serving children & families in Greater-Gainesville for 30+ years. Our staff is looking for volunteers to assist with a number of ‘Yoga 4 Youth’ initiatives &/or for special projects. Further details and position descriptions are available here. Interested parties should send a resume with cover letter ASAP to brianna.adele@gmail.com. Applicants should include (1) what about the position interests you AND (2) communicate general scheduling availability in their inquiries. Volunteers will be expected to pass a background check. Calling all College of Education UNDERGRADUATE students that received a 3.75 or higher in Fall 2015! In recognition of your hard work, you have earned your place on the Dean’s List. Congrats! 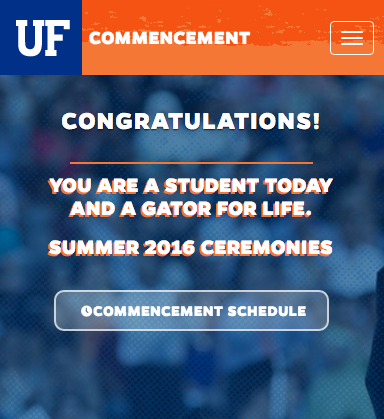 If you would like a formal certificate to celebrate your accomplishment, please email studenthelp@coe.ufl.edu from your Gatorlink address (include your full name). We will confirm when you can come collect your certificate for your professional portfolio. Keep up the good work and stay Gator strong! If you are completing your full-time internship this SPRING as an Elementary, SITE, or Special Ed intern, plan to attend the Professional Orientation Seminar on Wednesday, January 27th at the Kirby Smith Board Room. The session will be from 1:30-3:00pm. Two local principals will share information about interviewing and expectations of first-year teachers. Questions will also be answered about certification. For more information, please contact Rebecca Kidwell at rkidwell@coe.ufl.edu. The UF International Center invites students and faculty to learn about current study-abroad programs and opportunities at the UF Study Abroad Fair. Study-abroad programs help UF students discover new cultures, increase global awareness, enhance foreign language skills and establish new connections. 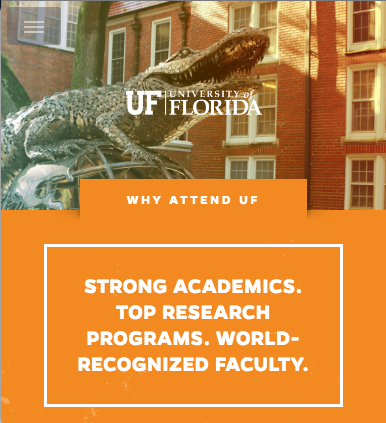 UF faculty is also strongly encouraged to lead their own study-abroad program and teach abroad. Overseas internship opportunities are available for students seeking internship credit. Most financial aid can be used for study-abroad programs and study abroad can be used to satisfy summer residency requirements. UF study abroad program directors, independent program providers and former study-abroad students will be available to share their international experiences. The UF Study Abroad Services staff will be available to explain the application process and help students and faculty begin their process and find the right program. The International Center encourages prospective “Global Gators” to visit here for more or call (352) 273-1539 for more information. The Black Student Union is hosting community organizer Josh Everett from The Direct Action & Research Training (DART) Center for an info session on Wednesday, January 20 at 6pm at the Institute of Black Culture to discuss careers in community organizing with individuals interested in uniting congregations and working for social, economic and racial justice. Positions start August 15, 2016 in Charleston, SC, Columbus, OH, Lexington, KY, Miami, Ft. Lauderdale and St. Petersburg, FL. Starting salary $34,000/year + benefits. Although it may be helpful, no prior organizing experience is necessary. Fluent speakers of Spanish and Haitian Creole are encouraged to apply. Internship opportunity that can lead to a full-time paid position. Areas of specialization we’re looking for are graphic design, education, and content writing. Experience with social media, online advertising, product placement or other promotional strategies are preferred. Interns will be expected to devote 15-20 hrs/week. Click here for more information. If interested, please contact David Moore at David.tres.moore@gmail.com. Signature Tutoring Services (www.signaturetutoring.com) is seeking educators in the Ocala, Florida area for part-time tutoring positions. Please click here for further information. If you are interested in exploring this opportunity further, please e-mail chogwood@signaturetutoring.com, or call 561-501-3628. We are looking for a responsible and caring person to watch our infant son, born in November, during the spring semester, starting in February. Hours are flexible but hoping for 20-25 hours a week with potential for more hours later in the semester (happy to consider someone 2-3 full days a week or 5 half days, etc). Looking for someone who has experience with infants, good references, and is a non-smoker. Willingness to drive him places is a plus but not necessary. If interested, please contact Lauren at 484-557-4950 or lpearlman@gmail.com. I am seeking an English tutor for my 14 year old daughter who is bilingual in English and Korean. Tutoring is needed in English skills, especially speaking and writing. One or two times a week till the end of February. If interested, please call 352-870-4627 or email mlee3377@gmail.com. Child needs help in reading and math. The tutor would need to come to Norton after school. Two or three days a week at the most for an hour each. Pay would be around $20-25 an hour. Please email leitecl@gm.sbac.edu. I am in need of a tutor for my eight year old. My child is having some mild issues with a reading disorder characterized by below average reading fluency and comprehension skills. We are looking for someone to start as soon as possible due to the third grade testing that will be held the end of March 2016. Please contact Ms. Head at (352) 792-7754. Student Government Elections are Soon! The Spring 2016 Student Government Elections are upcoming and the College of Education needs an undergraduate Student Senator (available to anyone with 60+ credits). Anyone with less credits may apply for a Freshman Seat (0-29 Credits) or Sophomore Seat (30-59 credits). Graduate Students may also slate for a Graduate Student Senate Seat. Qualifying & Slating occurs in the Reitz Union Grand Ballroom. The SG Elections will be held on February 16th & 17th from 8:30am-8:30pm. Also please note the deadline for all Absentee Ballot requests (for satellite campuses, online students, students who cannot vote at a polling location, etc) is 5pm on February 3rd. Check sg.ufl.edu/elections for more information or contact the Supervisor of Elections at elections@sg.ufl.edu with any questions. Current COE Senator Maddie McClinton would also be happy to help anyone interested in these positions for the upcoming year! Feel free to contact her at ed01@sg.ufl.edu. The STRESS Study Team at the University of Florida is seeking students who can participate in a treatment study that involves learning and building stress management skills. Students eligible for participation will receive a $20 amazon.com gift card at the end of the study. Click here for more information. 2016-2017 COLLEGE OF EDUCATION SCHOLARSHIPS due by 4:00pm, FRIDAY, JANUARY 15, 2016.